Posted by Teresa Mihelic HelpDesk on Wednesday, September 12th, 2012 at 12:14pm. 1. Tanaka Farms. I think this place tops everyone's list. It's called ' U-Pick Pumpkin Patch' . There's No Admission Charge and Parking is Free. What's really cool here, is that they have a large farm wagon available for rides ($5 per person, under 2y is free), a large petting zoo ($3 per person, under 2y is free), corn maze (free) and u-pick vegetables ( $2.99 per lb). Over the weekends they will have a Harvest Festival with games, rides, food, pumpkin decorating activities, etc. This is well worth the visit. When: from September 28th through Halloween, everyday from 9am to 6pm. Where:5380 3/4 University Dr, Irvine. 2.Stu Miller's Pumpkin Patch. This guys are in Aliso Viejo, and they always have a bungee jump, mechanical rides, games, petting zoo, a giant inflatable slide and other inflatables. When: visit their site, information not available yet. 3. Irvine Park Railroad and Pumpkin Patch: of course this one had to be in our list. Not only the Irvine Park is gorgeous year long, but for Halloween season they have a Haunted House, themed picture stands and many Halloween themed activities.They also have train rides, hay rides, tractor races, bounce houses, face painting and many others. The Pumpkin Patch is located just behind the train station and admission is FREE! Note that a gate entrance fee will be charged by the County of Orange for each vehicle that enters Irvine Regional Park, and there's separate charges for the activities. When: everyday from 10am to 5pm (6pm on weekends) Opens September 22nd. 4. Zoomars Pumpkin Patch. This is a cute place to take the kids too, as they have a large petting zoo, a mini train and pony rides, apart from having a great selection to the Pumpkin Patch. General admission is $8 for adults & $7 for kids. And after, you can take a walk through beautiful and historical San Juan Capistrano. When: open daily fom 10am to 5pm. 5. Pumpkin City's Pumpkin Patch. Very conveniently located at the back of the Laguna Hills Mall, the one acre farm offers pony rides, a petting zoo, many rides, carnival games, puppet shows and other activities. When: opens October 1st through Halloween,Monday – Thursday 10:30am – 8:30pm, Friday 10:30am – 10pm, Saturday 10am – 10pm & Sundays 10am – 8:30pm. 6.Johnson Brothers Pumpkin Patch. 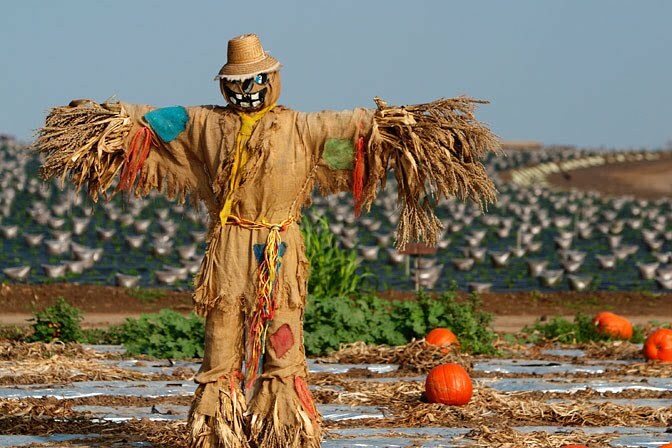 In Irvine, in addition to the thousands of pumpkins to choose from, they have pony rides, a petting zoo with many animals, do it yourself face painting, an Indian Village, a play area for kids and a bounce house. When: opens October 1st through Halloween.Everyday from 9:00 am to 9:00 pm. Where: 15500 Jeffrey Road and Irvine Center Drive, Irvine. Mountain Pines Christmas Tree Farm and Pumpkin Patch. This one is not as big as the rest listed here, but if you are looking for something smaller with enough activities for the kids too, this one does the trick. They have bounce houses, picture stands, pony rides, hay bale maze and many pumpkins to choose from. Free admission and parking lot. Also, all of the parks around us in Orange County will have their Halloween themes on! Disneyland and Legoland will be more kid friendly, but if you are looking for the spooky ones, head towards Knott's and Universal Studios. They all do a fantastic job! Hope you enjoy this information and enjoy your Pumpkin Carving!